I've taken the opportunity over the last few days to resume work on the Voyager bridge. 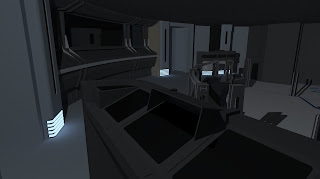 The main parts of progress so far are that I've more or less finished Harry/Tuvok's stations, and have begun working on the consoles behind them. During this process it's become evident that my bridge isn't perfectly symmetrical, which is causing some headaches so I'll need to fix that before I go much further. This is an issue because I'm creating one of each component, and then mirroring a copy to place on the other side of the bridge, and obviously unless the floor plan is 100% symmetrical, things don't fit properly. I'm not entirely sure how this happened as I distinctly remember drawing half the floor, and then copying/flipping that for the other half. Ah well, not a huge issue!